Λένα Πλάτωνος (Lena Platonos) is a Greek musician, pianist and music composer. One of the pioneers of Greek electronic music, she remains active today. Lena was born in Heraklion, Crete, and grew up in Athens. She began learning how to play the piano at the age of two and became a professional pianist before turning eighteen. Soon afterwards, she received a scholarship to study in the the Berlin and Vienna Academies , where she was exposed to jazz, rock and Middle Eastern music. She returned to Greece in the late 70’s and began working with the Hellenic Broadcasting Corporation. 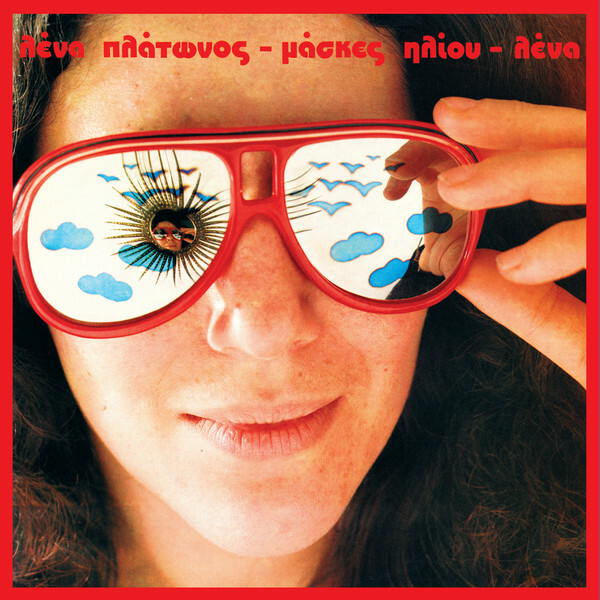 Released in 1984, ‘Μάσκες Ηλίου’ (‘Sun Masks’) was Lena Platonos’ first record to feature her own words and vocals. All instruments were performed by Lena herself.. ‘Sun Masks’ was inspired by Argentine writer, Julio Cortázar as well as the film ‘The Wall’ by Pink Floyd. “I began to reverse my thought process, to let melodies fade out, to turn to minimalism, to experiment on my Yamaha C60 synthesizer and a variety of “boxes” which I used to change the sound of my voice as well as the sound of the synthesizer” says Lena. The album featured experiments with different sounds and a new batch of electronic equipment, such as the legendary Roland TR 808 drum machine. Lena narrates each song in deadpan fashion, skillfully reciting her surreal Greek poetry. Her lyrics deal with the futility of love, the gap of human relationships, consumerist alienation in the bourgeois lifestyle of the 1980s. All songs have been remastered from the original master tapes for vinyl by George Horn at Fantasy Studios in Berkeley. The jacket is an exact replica of the 1984 edition, featuring a photograph of Lena wearing sunglasses or “sun masks”. Each copy includes a two-sided 11”x11” insert with lyrics in both Greek with English, and liner notes by Lena.